The Santa Charity 2014 Sign-Up! 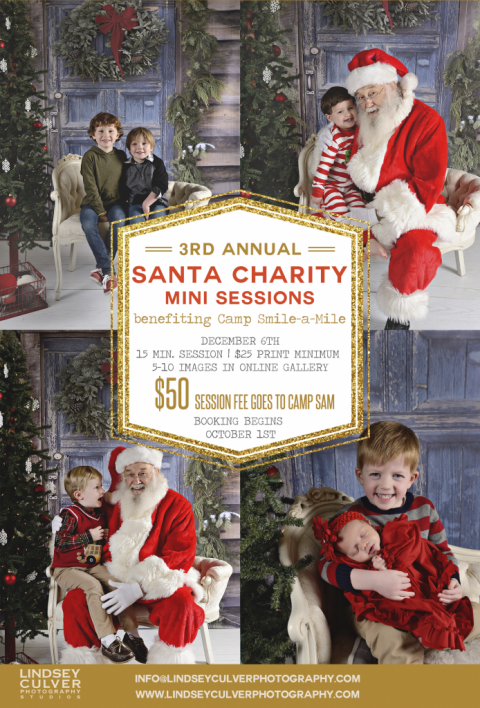 The 3rd Annual Santa Charity is now booking! What is the Santa Charity Session Like? You’ll be greeted with some hot cocoa, coffee, and delicious cookies at our downtown studio space. As in previous years (watch the videos here), we will have a different set design and will take pictures first without Santa. We’ll then have a meet and greet with Santa and take some fun pictures with Ol’ Saint Nick! Pictures will be ready in an online gallery within one week of the event. Prints and digital files are discounted from our normal pricing and delivered quickly – digital files available for immediate download and prints delivered to your home within one week of order. Who does the Santa Charity benefit this year? 100% of your session fee will be donated to Camp Smile-A-Mile! Camp Smile-A-Mile’s mission is to provide year round challenging, unforgettable recreational and educational experiences for young cancer patients, their families as well as young adult survivors from Alabama at no cost to the families. Our purpose is to provide these patients, families and survivors with avenues for fellowship, to help them cope with their disease, and to prepare them for life after cancer. I have many friends and clients who are deeply involved in Camp SAM and I have seen the good it does for our children in Alabama! We are excited to support this wonderful organization this year. Sign me up! How do I book my spot? Click HERE to hold your time! You will be taken to PayPal upon completion of your portrait agreement and session fees must be paid within 24 hours to hold your spot. Please email us with any additional questions, Santa can’t wait to see you this year!